Delaware Amateur Radio Association operates a station to allow non-licensed beginners a chance to try out ham radio. (R-L) Jillian Brodsky makes her first contacts by using the Station during Field Day under the guidance of Dr. Bob Dixon, Ostrander. The terrible three hurricanes of 2017, Harvey, Irma and Maria, left nothing but widespread destruction in Texas, Florida, Puerto Rico and the U.S. Virgin Islands — putting a black veil over emergency communication. In Puerto Rico, 130 licensed amateur radio operators, armed with the ability to adapt, gathered their equipment to provide weeks of critical emergency communication that saved countless lives during the disaster. This past weekend the airwaves crackled with conversations as amateur radio operators participated in the American Radio Relay League’s annual “Field Day.” The American Radio Relay League was founded in 1914 by Hiram Percy Maxim, and is the national non-commercial organization of radio amateurs. The Delaware Amateur Radio Association (DELARA), a local club located in Delaware County, spent the weekend participating in the nationwide emergency exercise. Broadway said that DELARA is based at the Red Cross on 380 Hills-Miller Road, where the amateurs have permanent stations established that are always ready for any communication requirements. The radio operators ran communications for a 24-hour period, making contact with as many stations as possible. He said the Red Cross is a minimal staff these days and the old director’s office is where the group now works from. Broadway said the group of about 50 amateurs even made an attempt to contact a satellite, but a connection never was established. He said it is better to find the problems during practice as opposed to when things are critical. 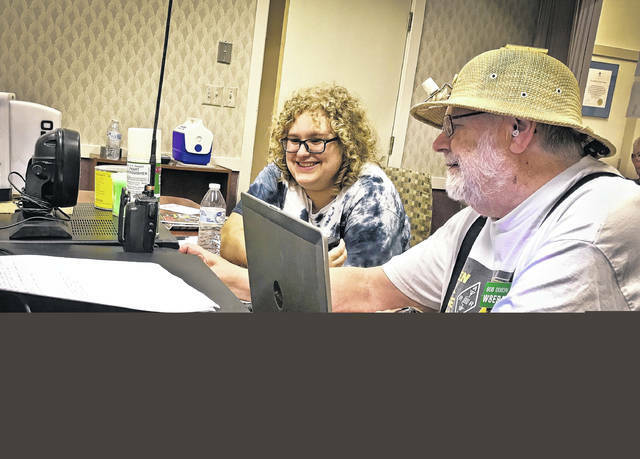 When the organizers of the Ironman 70.3 Ohio came to Delaware, there was only one group to trust the communications of the race too, the Amateur Radio Emergency Service (ARES). Rooks said last year that the Delaware ARES is the backup for the Delaware County Emergency Management Agency’s communication system. The now-retired ARES member Dr. Bob Dixon discovered a way to get live video of the Ironman course. According to Broadway, the group couldn’t get over a hill at Delaware Lake last year and they probably won’t try to provide video of the race this year. This entry was tagged American Radio Relay League, Bob Dixon, D. Anthony Botkin, Delaware Amateur Radio Association, Donn Rooks, Field Day, Stan Broadway. Bookmark the permalink.